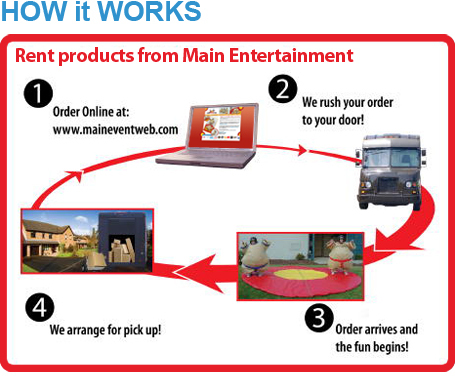 Welcome to MainEventWeb.com—We Deliver Fun! 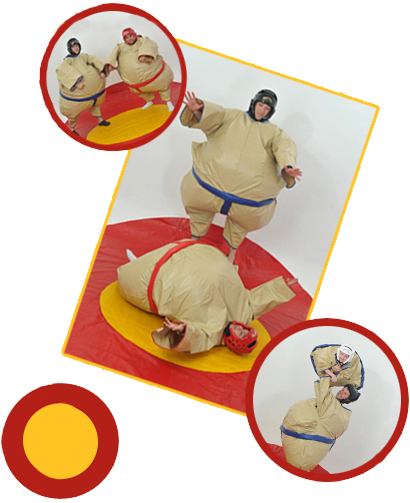 Sumo wrestling suits are perfect for you next corporate function or birthday party. We make the process simple and hassle-free. Our sumo suit rentals are hassle-free.Your suit will come in a convenient container. When the fun is over, we schedule the pick-up for you; the UPS driver will bring the return label to your door, place it on the shipping container, and return it to Main Event Web. All you need to do is place all of the items back in the shipping container and we provide a preapid return label for the return. You can either drop off the package at any UPS drop facility or UPS will pick them up for you. What Comes with My Sumo Wrestling Suit Rental? The sumo suits comfortably fit people of many shapes and sizes; from a 10-year old child to a 6’5” 260 pound man. They are truly one size fits most. Main Event Entertainment is located in Olney, IL. We have been providing entertainment for events of all shapes and sizes for 15 years. Bringing cost-effective, convenient entertainment is our specialty. We take pride in helping make your event a worry-free success. YES, we ship to all 48 states. We also ship to Hawaii, Alaska, Puerto Rico, Canada, and Mexico; however additional charges may apply. All of these items are delivered in One (1) 24" x 20" x 13" shipping container. WE RENT AND SHIP NATIONWIDE!!! If you are searching for sumo wrestling suits for rent then you have come to the right place whether it's a post-prom activity, after prom, post grad, grad night, corporate event, birthday party, or fundraising event, count on the professionals to deliver your sumo rental on time everytime.